When I was young, I liked to go to the Fron to my grandmother’s house. Fron is the Welsh for breast, and the Fron area of Nefyn was a group of houses situated on the breast of the Garn Boduan mountain on the south side of town. My grandmother lived at #2 Fron Terrace, the second house in a terrace of four. It was a small, two rooms up and two rooms down type house with an outside toilet. It was the house where I was born on August 22, 1941. It was not very far from where we lived at #6 Church Street in Nefyn, and I used to go up to the Fron nearly every day. I would always leave though before it got too dark. The large oak trees overhanging the road in front of the Dderwen farmhouse made the Fron a very eerie place at night, especially when the wind was howling through those tall trees. I was up in the Fron so often that I used to call my grandmother Mam Fron instead of Nain, the usual Welsh name for grandmother. There was no grandfather. He apparently had absconded to England and deserted the family several years earlier. My grandmother had four children Maggie my mother, John, Nellie and Bob. (She had, in fact, five children I later learnt – another story). How she managed to bring up all those children in that small house, I shall never know. Uncle Bob, the youngest of her children, lived in Pwllheli and died in September 2008. My grandmother had a gentleman friend named David Jones who lived in a small cottage just below Fron Cottage. He was a nice old guy, and everyone called him Dei Fron. Dei co-owned with his brother the house next door to his cottage called Cae’r Berllan, which they rented to two elderly ladies, one named Miss Lloyd-Jones, who was a teacher at Nefyn Primary School. Dei and his brother also co-owned a terrace of four unoccupied cottages above the old Baptist Chapel cemetery at the top of the Fron. Dei ate his meals at my grandmother’s house, and he was there nearly all the time. For a living, he ran a smallholding business with two cows, a dozen sheep, and chickens. He owned a field behind the cottages, and that’s where he kept his animals in the summer. He rented a small cowshed to keep his two cows in the winter. The cowshed was a small building located on the roadside almost directly across from the Seion Baptist Chapel. He also periodically rented a couple of fields from the Dderwen and Holborn farms to provide extra pasture for his animals. Dei’s two cows were often placed in a small field in the Ty’n Coed Valley to the west of the Fron. I used to go along with him to the field to milk the cows. The direction to the field was through the gate opposite Tan-y-Dderwen, and along the ‘weirgloedd’ as it was called, a public footpath that followed a wall on the southern edge of a very famous Nefyn field. The field was famous for two reasons. It was the area where Edward 1st held his triumphant tournament after his conquest of Wales in 1284. 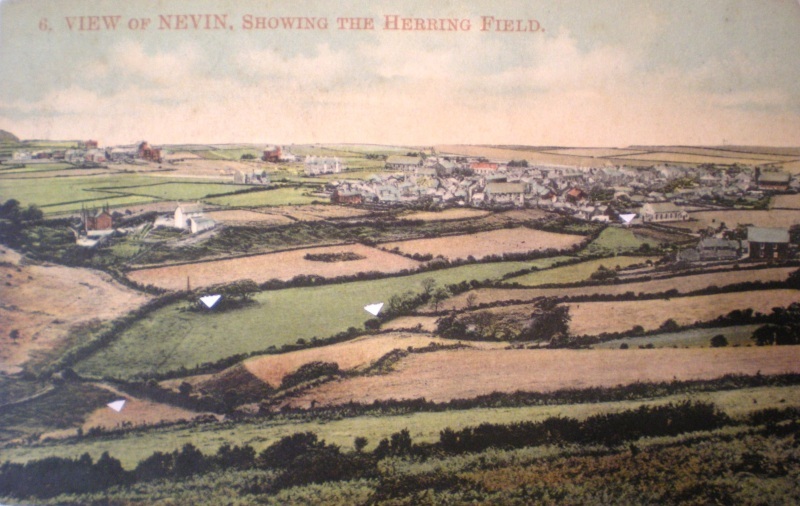 It was also the field that, in later years, had been shaped like a herring in recognition of Nefyn’s fame as the herring capital of Wales. The herring shape of the field was clearly visible from the top of Garn Boduan behind the town. Forming the herrings ‘eye’ was a little hillock called Bryn Derw, which had appropriately a small number of oak trees growing on it. The field where Dei kept the two cows was to the left of the ‘giat fochyn’, the pig gate located near Bryn Derw at the head end of the herring field. Dei had erected a small, corrugated-roof, open-sided shed against one wall in the field so the cows could find shelter, and where he could feed and tie up the cows for milking. My job on these excursions was to carry the three-legged stool that he sat on to milk the cows. Dei carried two milk buckets with wooden lids that hung from a large wooden yoke carried across his shoulders. The white triangle markers show the footpath and wall along where Dei killed the vipers, Bryn Derw (the eye of the herring), the field where Dei milked the two cows, and his winter's cowshed opposite the Seion Baptist Chapel. Nearly every time we went, Dei would ask me before we got started, to run across the field near Tan-y-Dderwen to get a thin, flexible, branch ‘gwialen’ off the willow tree. He would use that branch to kill any vipers that we spotted on the wall along the path out to the field. There was a high level of paranoia about snakes in Nefyn at the time. A few years earlier, a little girl had died after being bitten by a viper outside her house Tyddyn Gwer on the mountainside. According to my mother, the little girl was innocently left on the grass while the mother was hanging clothes on the line. When the toddler suddenly screamed, the mother ran over and spotted the viper and the bite mark. She ran the child all the way down to the doctor’s house by the War Memorial in Nefyn. The joshing from the mother running all that way spread the poison throughout the little girl’s body, and she died before they could get her to hospital. My Mam knew the girl’s mother, and she would always get very emotional telling the story. My mother was continually warning us children thereafter to watch out for snakes. But in those days children played outside during the summer school holidays, and any such constraints were hopeless to enforce. Nefyn then was very much of an open little town, with no locked doors, with children running freely around playing cowboys and indians on the mountainside, lions versus tigers, climbing the cliffs, fishing on the sea shore, and playing football in the fields, streets, or on the sands. The children only came home in time for their meals. Dei would go after the vipers very aggressively, and there used to be several sunning themselves along that wall. The willow branch was ideal for the task since it was flexible enough to bend on the wall. I remember him killing two vipers one afternoon, and hanging them over the barbwire fence on the right side of the path. On the return journey from milking the cows, he was very bothered that one of the vipers was missing. He promptly told me that a cigfran (raven) had probably taken it, but I knew in his own mind he was wondering whether he had really killed it or not. Then resorting to the traditional mysticism associated with snakes in Wales, he told me that we had to go milking every day otherwise snakes would suckle the cows milk. He also told me how the Welshman St Patrick had thrown the vipers out of Ireland, implying there was a need to clean that place out, but that St. Patrick did not get rid of the snakes in Wales, since Wales was fine as it was. Milking the cows with Dei was always an experience. The cows would come to the shed quite voluntarily because they were going to be fed. But with no stalls to hold them, it was very difficult to keep them standing in the same position for milking. Dei would sit on the stool with his capped head resting on the side of the cow, milking into the bucket held between his legs. The cow would move, and Dei’s cap would fall off – sometimes into the bucket. He was very embarrassed about his bald spot. He would immediately put his cap back on and mumble a Welsh curse word, which I was not supposed to hear. Then he would stand up, move the stool, and start milking again. The cow’s tail would whack him one in the face, another slightly louder mumbled Welsh curse word, and so it would go on. But he persevered, and he had patience galore. He would often have me lean over for a quick mouthful when he was milking Nanw, the older, better-behaved cow. After the milking was finished, the wooden lids would be secured on the buckets, the buckets would be attached to the yoke, the yoke would be lifted on his shoulders, and both Dei and I would head back along the path to the Fron. He was quite a character, and he always behaved in a very gentlemanly manner. I remember coming back with him from milking one time, and just as we exited on to the road at Tan-y-Dderwen, this English lady whom he knew came walking down the street from the Fron. Whilst still holding the yoke across his shoulders with one hand, and bending his knees to stabilize the full milk buckets on the road, he used the other hand to lift the cap off his head in a gesture of respect to the lady. Most of the milk from Dei’s two cows was used to make butter. The pails would be carried to one of the old cottages at the top of the Fron. After removing the milk required for daily use, the remainder was emptied into a blue-colored, wooden butter churn with a large iron handle on its side. I remember that butter churn very well. Every week or so, there would be sufficient milk in the churn to make butter. My grandmother would go up to the cottage to help, and I would go along. I would turn the handle, and Dei would periodically open the churn and scoop out the floating butter. The butter would be beaten on a wooden board with wooden paddles until all the butter- milk remnants were out of it. Then he would add salt to the butter, and finally form as many six-inch diameter butter tablets as he could, and stamp each tablet with a beautiful swan mold. He was so proud of his "menyn bach". It was his unique butter and he sold some of it locally. It was certainly treasured at my grandmother’s house where it was used as a breakfast special on toast during the subsequent couple of weeks. The remaining buttermilk "llaeth enwyn", was used to make "tatws llaeth" or "bara llaeth" - potatoes or bread with buttermilk, both very special treats. There used to be a lot of activities in those old cottages. Dei was the conductor of the Nefyn Band at one time, and the band used to practice in one them. They later moved to a larger space in the meeting room at the bottom of Madryn Hall. Dei had a lighted brooder in one of the other cottages where he would hatch chicks and raise them to pullet size so they could then be released outside with all his other chickens. It was also the place where the pullets were later killed, feathered, and cleaned for the occasional Sunday dinner. Dei also worked periodically as a driver and handy man for Mr Cowbourne in Bryn Beuno on Ty’n Pwll Lane. Mr Cowbourne had a huge, multi-level, pigeon coop at Bryn Beuno, and Dei had the task one time of catching and removing several dozen pigeons from the coop. I remember going over to Bryn Beuno with him in his little box-shaped Austin Seven and returning to that cottage in the Fron with a crate full of pigeons. My Uncle John Fron, when he was home from the sea, loved to hunt and poach on the mountains above Nefyn.. He would come back with rabbits, pheasants, wild duck, and an occasional hare and they would all be prepared in that old cottage. One corner of the place was full of feathers. I remember Dei and my grandmother plucking the feathers off some pheasants and wild ducks that Uncle John had poached somewhere in Boduan. They asked me to stand guard at the open doorway in case someone came along. They did not want anyone to know what was going on up there. Anyway, I was not a particularly good guard, and was easily distracted. Dei suddenly stood up, threw his apron over the pheasant feathers on the floor, and rushed to stand in the open doorway to block the view. He proceeded then to converse with someone outside. With the conversation over, he indicated there was no problem, that it was just old Robin going for a walk up the Garn. I was abruptly relieved of any further sentry duty. My Uncle John would not only bring pheasants and wild ducks home, but also eggs from their nests. He had a knack of being able to find those birds nest very easily. He would only bring a couple of eggs from each nest he found, and only if my grandmother or Dei had a hen brooding. The hen was then given the eggs to sit on, and it was always hilarious to see the hen proudly stepping out with a cornucopia of different chicks. As the little pheasants, wild ducks and whatever other eggs John had found grew, their wings would be clipped to keep them from flying away. There would always be a variety of game birds to eat when John Fron was home. The escapade Dei and I had with my grandmother’s Rhode Island Red cockerel was also unforgettable. Uncle Bob had suggested I enter the rooster into the Nefyn Easter Show. He convinced me it was going to win first prize, although he later confided that it did not have a chance. Anyway, he got me all excited about the rooster’s prospects, and I made plans to enter it into the Show. I filled out a form, and got instructions to bring the rooster to the Church Hall early in the morning so it could be judged. The Nefyn Easter Show at the time was held in the field where Plas Hafan is now located. Dei and I made plans to get the rooster ready a couple of days earlier. First we had to catch the bird. That was going to be a challenge because it was not the timid, friendly type - it was in fact, downright nasty. You could not get near it, and if you did, it would peck at you viciously. Dei helped me rig up a narrow cage with a triggered door to catch the bird, and it took me all day to entice it into the trap. Catching it in a narrow cage was the easiest way to avoid disturbing its beautiful plumage. We then took it into one of the cottages where Dei put a sock over its head to quiet it down. Then we proceeded to wash the bird down, scraping the crap off its legs, and brushing off its comb with a toothbrush etc to make him presentable. The following morning, with a sack over the cage, I proceeded with Dei from the Fron towards the Church Hall. The cage was not closed correctly because when we got to Tan-y-Dderwen, the rooster got out of the cage, and flew down the road in a flurry of feathers with Dei and I chasing it. We finally cornered and grabbed it inside the railings of the Seion Baptist Chapel. By now, the cockerel was in a dreadful state. In the excitement of the chase, it had pooped all over itself. A couple of its majestic tail and wing feathers had come out when we grabbed it, and the others were sticking out in all different directions. We just stuffed it back into the cage and proceeded, as if nothing had happened, through Nefyn, and into the Church Hall. There were only three Rhode Island Red roosters including ours entered into the competition. The other two got first and second ribbon prize awards. Ours got nothing – nothing, not even third place. I was told the judge just walked right past it. We quietly snuck the bird out of there before the Show opened, and took it back to the Fron in disgrace. The whole episode was a royal disaster. Bob and I laughed about the incident often in later years. Dei loved his black and white Welsh Border Collie, Lassie. I remember going with him in the Austin Seven down the Lleyn Peninsula to a farm in Rhiw to pick up Lassie when she was a pup. When the dog grew up, Dei would spend hours training her with his sheep in the field behind the cottages in the Fron. And Lassie did become a very capable sheepdog. I remember on two occasions in 1955 helping him move his sheep from the Dderwen-owned field opposite Trem-y-Don to the ‘tir-cwmin’ (common-land) up to Garndderwas - the mountain above Nefyn. The sheep were moved to the mountain after the lambs had matured in late spring, and brought back down in the autumn. Lassie went promptly into the field and, with shouts and whistles from Dei, brought the dozen or so sheep to the gate. Then with me in the lead to alert any on-coming traffic, and with Dei and Lassie behind, we moved the flock up the single-lane mountain road. We did not meet a single car. There was hardly any traffic in Nefyn in those days. We turned the sheep on to the pasture through a gate on the left side of the road on the flat crest of the mountain. Bringing the sheep back down from the mountain four months later was more challenging for two reasons. We first had to find the sheep on the rather expansive pasture up there, and secondly old Dei by now was having problems with a heart condition which was beginning to impede his mobility. Lassie came through like a charm again. Dei was able to remain at the gate, whistling and shouting instructions, while Lassie and I scrambled through the heather and gorse on the mountain to find the sheep and their lambs and bring them to the gate. All were accounted for. The familiarity of the sheep with the dog also helped the situation. When we moved down the mountain road, we did meet a car this time near Lon Josyn – the lane that leads into Gwaith John Lloyd. I had to open the gate and let the sheep move on to the lane in order to allow the car to pass. Again, being familiar and well trained, Lassie was able to squeeze past the sheep on that narrow lane, and return them on to the road. We got them all back into the original field opposite Trem-y-Don successfully. Since Dei was one of the few registered drivers in Nefyn, he was often asked to help others learn how to drive so they could pass their test. I remember him teaching a fellow Fron resident named Ted, who had a market gardening business, and who wanted to pass the test in his van so he could deliver produce to his customers. I went along with Dei and Ted in the van one time. We were driving near Edern with Dei instructing when to change gears etc when the car suddenly developed a startling vibration that got louder and louder. It got so bad that we had to stop to inspect the van. I was highly praised when I noticed that both front wheels were very oddly angled. Ted apparently had rotated the front wheels just that morning, and had forgotten to tighten the nuts. The wheels were nearly off the van, and we could have easily lost a wheel going down the hill into Edern. Old Dei died suddenly of a heart attack in the early 1960’s when I was in college in Cardiff. I received a letter from my grandmother indicating that he had passed away. The Fron and my grandmother’s house were not the same afterwards. I always remember his almost fanatical liking of western cowboy books. His favorite author was Zane Grey. I remember being in his cottage on a winters evening sitting in the rocking chair by the fire. He was sitting at his desk with a Zane Gray, and he was reading the book out loud to me mentioning a place in America called ‘Kansas City, Missouri’. He liked reading the books out loud, and the excitement in his voice was very evident when the good cowboy persevered and came out ahead of the bad cowboy. It was the first time I had heard of Kansas City, but it was certainly not the last. Little did Dei and I know at the time, that twenty-five years later I would be living in America, and in June 1974 I would be driving on Interstate 70 through Kansas City, Missouri. He would have been both shocked and thrilled. As I was driving on 70 West through Kansas City that day, I was most certainly thinking about old Dei, and all the exciting escapades I had with him as a child growing up in Nefyn so many years earlier.